TV journalist reporting from a crime scene. 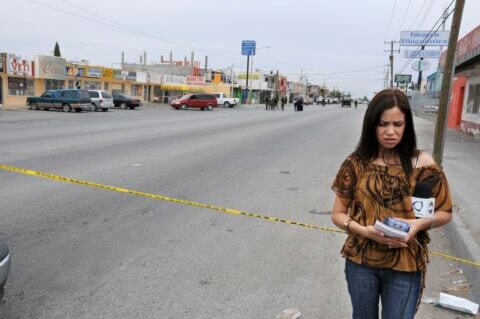 Ciudad Juarez is the most violent city in Mexico, and the epicentre of the war on drugs. In 2008, 2,000 people were murdered, an average of 5.5 murders a day. These were the words of journalist Wa Lone as he was escorted to a Burmese prison on 3 September, with his Reuters colleague Kyaw Soe Oo. They are now serving seven years in prison for reporting the mass murder of 10 Rohingya civilians in Inn Dinn village in Rakhine State last year. As the UN Human Rights Council gathers in Geneva this month, the new High Commissioner for Human Rights, Michelle Bachelet, has called this case “shocking”, demanding their immediate release. A UN report presented to the Council this week details how abuses across Myanmar, including those the Reuters journalists sought to expose, amount to crimes against humanity and possible genocide. The report connects the absence of domestic accountability to the government’s routine and active measures to restrict independent media and stifle legitimate dissent. It’s therefore timely that the safety of journalists is a priority issue at this month’s UN Human Rights Council session. The situation is dire. According to the UN, 68 journalists have been killed globally in 2018 to date. Prospects for justice in these cases are remote: for the 930 killings recorded between 2012 and 2016, the rate of impunity is 90%. Stories that people would literally kill to suppress, are often the most important for the public to know. They detail organised crime, conflict, environmental degradation, corruption; the journalists on these beats play an essential role in society. The failure to identify those responsible for the murder in broad daylight 11 months ago of investigative journalist Daphne Caruana Galizia in Malta, is emblematic of this global crisis. Emblematic also is the situation in Mexico; in January this year, Agustin Silva became the 24th journalist disappeared since 2003. Like the vast majority of disappeared journalists, Silva was reporting on the security situation in Mexico. ARTICLE 19’s Mexico and Central America office has recorded 116 journalists killed in Mexico since 2000, with impunity being the dominant trend. Since the disappearance of journalist Jean Bigirimana in Burundi in July 2016, the only safe space for journalists is in exile – and even then, the government has taken measures to revoke licenses for media operating from abroad and online. These attacks are an assault not only on the rights of the individuals they target, but on freedom of expression itself, and therefore are an attack on society as a whole. They deny us all the right to know, depriving us information essential for understanding the world around us, and for holding our governments to account. It is therefore essential that public figures, including leaders in government, defend the role of a free, independent, and pluralistic media. The tendency of leaders, even in democracies with long records of defending press freedom such as the United States, to denigrate media they disagree with, to deliberately undermine public trust in journalism regardless of its potential to expose journalists to attack, shows the dangerous path we are on. The risks extend beyond physical attacks too, as numerous strategies are employed to remove voices of criticism from the public sphere. Arbitrary arrests and detentions, often as a consequence of relentless persecution in the courts, is one such tactic. Turkey is the world’s most prolific jailer of journalists, with well over 100 behind bars. Erdoğan has sought to silence all criticism by equating journalism with terrorism. Nedim Türfent, a journalist for pro-Kurdish news agency DICA was sentenced to almost 9 years in prison for reporting on the security situation – he and witnesses in his trial report being tortured at the hands of authorities. Such abuses in detention are not uncommon. Last month, the UN Human Rights Committee, the treaty body overseeing States’ adherence to the International Covenant on Civil and Political Rights, condemned the detention and torture of journalist Lydia Cacho in Mexico. Justice is still needed in her case. Increasingly, online expression is the target. The arrest of award-winning photojournalist Shahidul Alam in August, detained for sharing online footage and commentary on a protest. Charged under the draconian Information and Communications Technology Act for allegedly spreading “false information”, he has been denied bail and we have concern for his wellbeing following allegations of ill-treatment in custody. The list goes on. In Egypt, Mamoud Abou Zeid (the photojournalist also known as Shawkan) is serving five years’ in prison for his work; in Chechnya, journalist Zhalaudi Geriev is mid-way through a 3-year custodial sentence; in Iran, Amir Mohammad Hossein Miresmaili and Hengameh Shahidi are both behind bars. But it isn’t just abuses of criminal laws. Before she was murdered, Daphne Caruana Galizia was pursued through relentless and vexatious libel law suits. Threats to journalists are therefore varied and multiple. Government surveillance, including through hacking, has targeted journalists and those advocating for their rights in Mexico, showing how the risk landscape is evolving in the digital age. In Russia, the role out of the 2016 Yarovaya law has seen online censorship and surveillance explode, with attempts to block secure messaging app Telegram, and threats to block and fine online media outlets. A draft resolution on the safety of journalists, tabled at the UN Human Rights Council today, seeks to call for an end to many of these human rights violations. For States to show their support for the resolution’s commitments by cosponsoring it, ahead of its likely adoption on 27 and 28 September, would be a step in the right direction. However, these commitments will only have any meaning if States translate them into national action. If States continue to ignore their international commitments and violate the rights of journalists, thereby undermining all our rights to information, they must be called out for these violations, and for their hypocrisy.